...the furnace is run. Known as a cupolette, it is essentially a refractory-lined drum with a movable lid, and a strong blast of air entering about 1/3 of the way up. 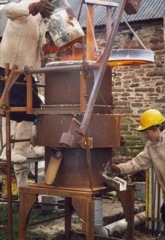 It is half filled with foundry coke which is then brought close to white heat, and is further charged (seen here) with alternating layers of coke and broken up scrap iron.